Respawn and EA have teamed up to create the next step in online multiplayer with Titanfall, and frankly, they nailed it right on the head. Formed back in 2010, Respawn was born from co-creators of Call of Duty. Working for years on this project had some nervous as to what was really going on behind closed doors, but it seems it was worth all the wait and secrecy. Titanfall has blown me away and actually reignited my passion for online gaming and it's something I haven't felt since the release of CS:Source. Taking place in the future where space exploration is common place, it seems that corporations are up to their usual no good of exploiting people, governments, and resources to maximize company profits. What they didn't count on were their own technologies, in the form of Titans, being used against them by citizens rising up and pushing back against their tyrannical ways to protect their homes. To my dismay though, the story is bland and uneventful and it is difficult to care about either side or the characters involved. Your performance in battle does not change the outcome of either story and the only positives to actually completing both sides of the campaign are unlocking the Ogre and Stryder Titans for custom load-outs in multiplayer. What blew me away the most about this game was how quickly I slipped in the role of a pilot and using the jump pack to move quickly and efficiently around a map. Many games in the past have claimed to revolutionize gaming with 'free-running' controls and unfortunately they didn't deliver. Titanfall has met and exceeded my expectations of control and movement. The movement tutorial really locked in on how to train people to navigate around the world. Its simple movements set a nice even progression for each pilot's movement skill and eventually lets you chain them together in a way that makes you feel comfortable about moving around buildings and environments. As a pilot you feel fast and unstoppable with your speed and agility. Then you step into a Titan and it just gets better. You immediately feel a sense of size and weight when in a Titan. You move slower and more solid about the map. You also lose the ability to jump but gain the action of dashing and sliding around on the ground. It's great for escaping enemy fire and putting distance between you and a group of enemy pilots trying to take you down. You feel powerful and a force to be reckoned with but definitely not invincible. You still have weaknesses and need to keep them in mind as you approach situations. Enemies can run up to the roof of a building, jump on top of your titan, and destroy it before jumping off again. It's a level playing field where man and titan are nearly equals. The combat in Titanfall is smooth and fast. Everything flows together so nicely that you forget you are actually playing a game. You get drawn into firefights and shoot outs that seem incredibly real. The weapons are futuristic without feeling alien. You can look at something and know exactly what it is and how to use it effectively with upgrades that are great and actually feel useful. You want to work hard to complete the challenges that gain you these add-ons and it's something I have felt has been lacking in other games for a long time. The option to custom tailor your playing style with different abilities for both your pilot and titan bring a sense of individuality and surprise to the game. Not everyone is the same as you and the use of certain abilities by others can surprise or catch you off guard. It is something that adds a new level to replayability. Burn cards just add to this as you can give temporary fire power or other bonuses to your character or titan at any point in a match when you respawn and lasts as long as you do. Then, when you die, you lose that bonus and may choose another one until you have used all your predetermined burn cards for that engagement. It is this exact level of constant surprise that makes Titanfall fantastic. My personal favorite was the DMR; a great little mid-range rifle that lets you sit back and pick off enemies from a safer distance. Much more my playing style. The three titan classes are a great balance in play styles with my personal favorite, the Stryder class, fitting the quick maneuvering I enjoy. The hit and run tactics were great so dashing in, dealing a massive blow, and retreating to recharge shields was an awesome way to help the slower moving titans and let them beat away at other while I distracted enemies zipping around the firefight. The game looks amazing and the level designs are creative. With pilots able to move almost freely and without restriction, I was forced to rethink offensive and defensive tactics. Threats can come from almost any direction and you must plan accordingly. Then, as you step into a Titan, it almost feels like the map has changed to take into the account the titans size and movements. Big open areas that spell danger for lonely pilots become an arena of destruction for Titan battles. One of my favorite maps from both the beta and the full game was Fracture. I felt it was mostly balanced for both Pilot and Titan fights and allowed a great range of play styles to be used simultaneously. Rumors of interactive environments had me hoping for the option of setting traps using the local wildlife, but was let down when I attempted multiple time to engage flying aliens only to have them ignore me and chase after the AI grunts and Specters. Somewhat cool but nothing like I had hoped for. Game modes have the standard multiplayer sets. Attrition (Team Deathmatch), Capture the Flag, Hardpoint (Point Defense), all work with Titans and Pilots fighting together. Last Titan Standing has every pilot starting in a Titan and having a free for all until the other teams' Titans have been wiped from the map. 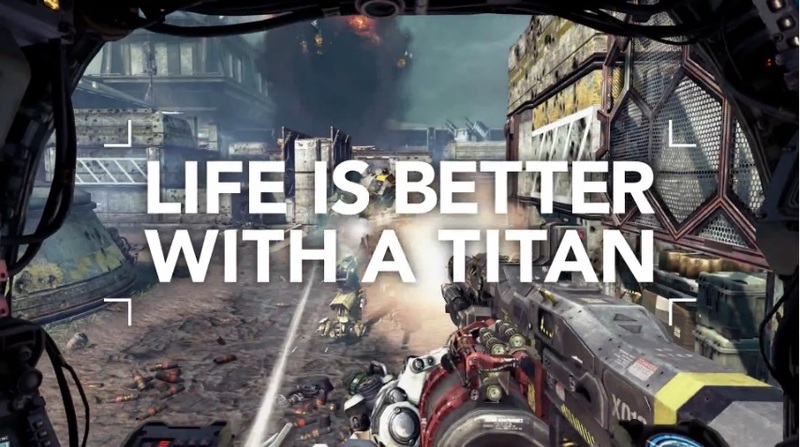 Like the advertisements say, life is better with a titan and Last Titan Standing emphasizes that sentiment. Pilot Hunter is similar to Attrition but your team only earns point for Pilot kills. I personally like Attrition but having the options to mix it up is what I think will help keep me interested in the game down the road. Although there aren't a ton of modes available up front, they are all fun. That isn't something a game like Call of Duty can say about their massive amount of playlists. All-in-all, Respawn has crafted an amazing and long lasting game that has drawn me back to online shooters and I cannot be happier about it. Titanfall is a game that I didn't know I was missing, but once I played it, I had to have more. Hopefully with DLC and a rabid fanbase that I'm sure it will collect, this game will be as long lasting and enjoyable as the other online shooter giants that have come before it. Buy and enjoy fellow nerds. Ill see you on the Battlefield.